FRIENDSHIP GAMES: The bond between the two teams, not to mention the score, couldn’t have been any tighter. LA VERNE, California, November 11, 2017 — Aussies have given the world Ugg boots, Koalas, Outback Steakhouse and the Selfie (yes, they claim to have invented it! 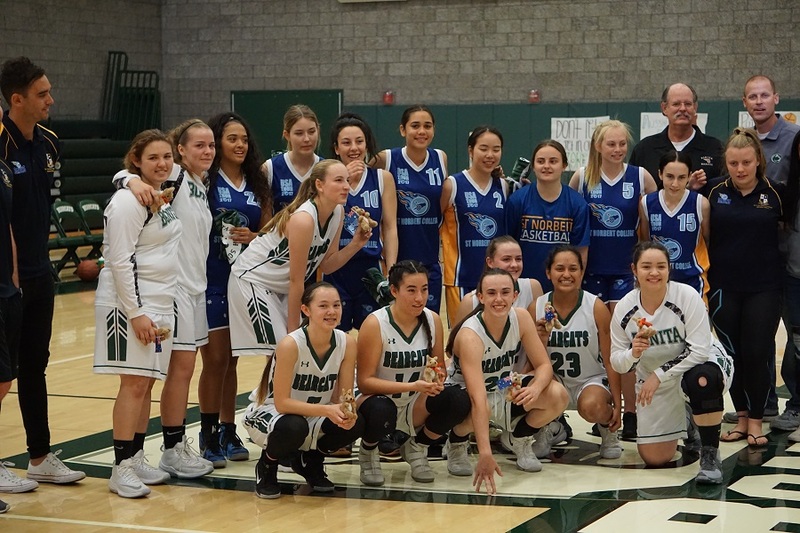 ), and on Monday in La Verne, the St. Norbert Varsity Girls from Perth, Australia, on their 16-day swing through California,gave the Bonita Varsity Girls all they could handle on Monday before falling 41-39 at Bonita’s Ketterling Court. 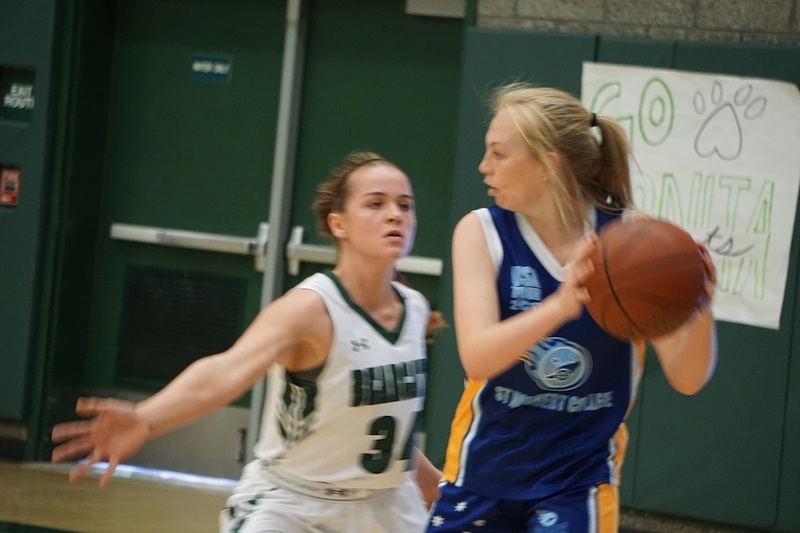 With the score knotted at 38-38, Bonita’s Sami Riggs drove the ball down the length of the court before threading a beautiful bounce pass to Tiffany Hall for the layup and a 40-38 advantage. St. Norbert came right back to convert the front end of a one-and-one to edge closer, 40-39, but couldn’t pick up the second free throw, and had to foul. Bonita converted the front-end, but missed the second. Fittingly, Riggs, the high-scorer on the floor with 26 points, snatched the rebound and ran out the game’s final few seconds. Once the game was underway, the action turned serious, as Bonita’s Heather Hill flashes some defense. Throughout the contest it looked like anybody’s game. St. Norbert took a 12-11 first quarter lead before Bonita fought back for an 18-16 advantage at the half. With seven points in the second quarter, Riggs scored all of Bonita’s second quarter points. 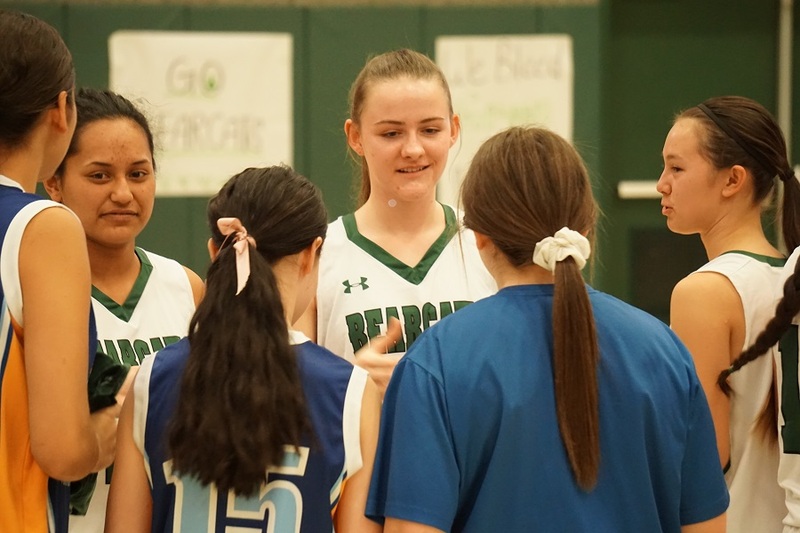 For most of the third period Bonita played catch up, but Riggs hit a trey and a deuce with the clock expiring to leave Bonita trailing by just a point, 28-27. In the final quarter, the two teams exchanged leads and then with 52 seconds remaining, the score was 38-38. St. Norbert first went to work on offense, but despite a good look, couldn’t get the shot to drop. Off the miss, Riggs collected the rebound and dribbled the length of the court before dumping off the ball to Hall for what turned out to be the game-winner. Bonita coach Darren Baumunk was happy with the win, but expressed concern that the team needs to find more scoring from other players not name Riggs. 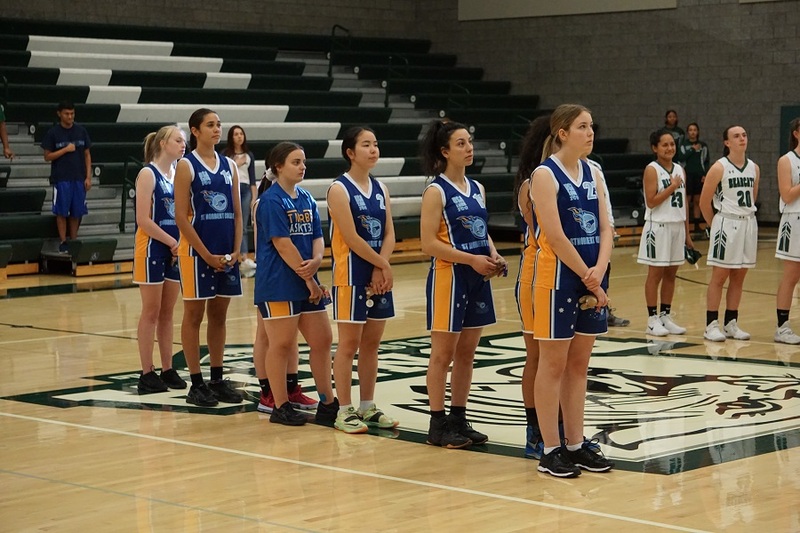 The girls observe the playing of both countries’ national anthems. “Otherwise, teams around the league will overload their defense against her and dare someone else to beat them,” Baumunk said. St. Norbert’s coach, Luke Ford, liked his team’s up-tempo play, including the 19 points he got from Savahna Nevrill. “We almost got the win, the outcome was in doubt right to the very end,” he said. Ford and St. Norbert didn’t have much time to dwell on the nail-biting loss. They were in a hurry to board a bus that was taking them to a Clippers game at the Staples Center. On their tour, they also have visited, San Diego, Sacramento and San Francisco. And for a couple of hours, they got to visit La Verne and experience Bonita basketball. Before the game, the players met at half-court. All season long, La Verne Online will be bringing you the action. 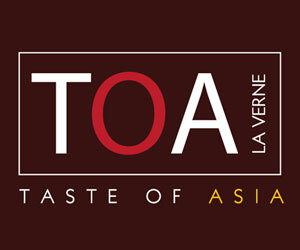 Like us on Facebook, sign up for our weekly updates. Nobody covers the news in La Verne like LaVerneOnline!